Buy a list of doctors with the specific specialty of gastroenterology. 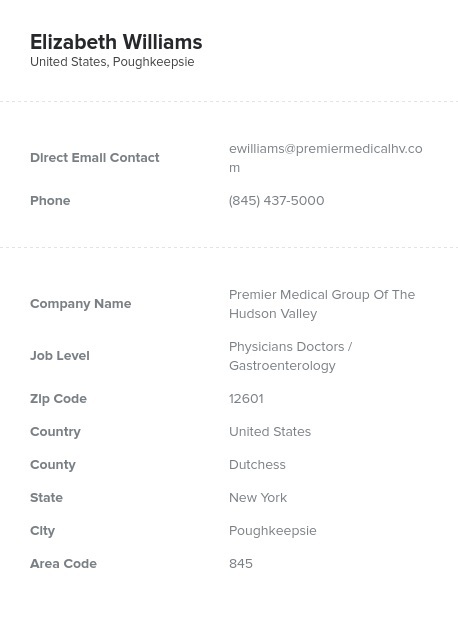 This is an accurate, human-verified lead list of gastroenterologists that contains all of the information you need to digest: emails, phone numbers, addresses, names, titles, and more. Doctors who specialize in gastroenterology focus on the digestive system and its disorders, which may include anything from ulcers to Crohn's disease, to gastrointestinal cancers, to appendicitis. They require a unique knowledge of this important system, which includes the small and large intestines, the stomach, and many more vital organs. If you have a pharmaceutical, medical device, piece of equipment, or recommended publication for this unique group, you can get into contact with them specifically with our pre-built gastroenterologist email list. Rather than simply downloading a general list of doctors, buy this specialized email database to find those working in the medical field that's most relevant to your product or service: gastroenterology. This is one of our many pre-built data lists, which have been created to help businesses market to specialized professionals within their target audience. Whether you plan to email leads about a heartburn-relieving tablet, a drug for ulcers, or medical equipment for gastric bypasses, having a contact directory full of doctors with that specialty can be much more valuable to your business. It can save both time and energy during your medical and pharmaceutical marketing efforts. All of the data we provide is accurate, detailed, and easy to digest; you can plug it right into your CRM. Buy this unique mailing list of verified sales leads to start conducting more effective B2B marketing campaigns.